My great grandmother passed along a love of barbecue meatballs to our family — and it’s a recipe we’ve made over and over again. We love to serve these with twice baked potatoes, homemade rolls, and tossed salad. I did not have any fresh ground beef to make the meatballs, I only had frozen and with the weather being warm today I did not want to heat up the oven. So I will have to make these another time. The recipe looks very good so I am sure our family will really like them. Today I did make some Spice Rubbed Steaks for the freezer. With the rub already on the meat all I have to do is thaw and grill. Makes for an easy summer meal. I like to cook the steak and serve it on top of fresh lettuce from our garden. Meatloaf mix was on sale the past week. I picked some up at that time but had to run to the store for other ingredients so it looks like I’ll be trying these tomorrow. They look delicious. I love the idea that you don’t cook your meatballs first. So do you always start w/ fresh ground meat? Not previously frozen? (different Heather) Not sure about it being a safety issue, but it is a quality issue. You lose a little each time. This is an old rule! The USDA website is pretty clear that you can refreeze previously frozen meat without cooking it as long as it hasn’t been out of the fridge for more than 2 hours. There is a quality issue as the other Heather said. I have bought huge amounts of ground beef, have it in portion size packages, frozen. And I thaw it and make these very meatballs, freeze them, and then bake them. We have made them over and over and over, and so have my friends, and no one has ever gotten sick from them. Don’t let the meat get warm before you mix the meatballs and get them in the freezer, but it really isn’t an issue if you use common sense. My Mom did this all of my growing up years too. You probably could leave them out, though they wouldn’t stick together quite as well. Does anyone else have suggestions for egg substitutes for this recipe? When you do the meatballs, just omit the egg. We are egg free at our house-dh is severely allergic, and I make a similar meatball often. If after combining all ingredients it seems a bit too crumbly, just add a little extra milk until you get the right consistency. Everyone always says my meatballs and meatloaf are delicious, no one misses the egg. Unless you have a dairy issue, we add parm cheese instead of eggs (when I forget to buy them…sheesh) or have used just some grated up cheese to help bind. We use about a quarter to a third cup/per 2 lbs. of meat. Hope that helps for another idea…. I have made meatloaf and meatballs by omiting the egg, but it seems to kinda crumble back into ground beef chunks as opposed to staying clumped together. I am DEFINITELY going to be trying these! I’m one of those people, though, who will make a meal like this then not have the sauce ingredients still around when I’m ready to actually make it! Yes, you can definitely do that. In a pinch, I’ve also just used barbecue sauce & brown sugar or ketchup & brown sugar. This is similar to mine – except I use italian seasoning & worcestershire sauce. 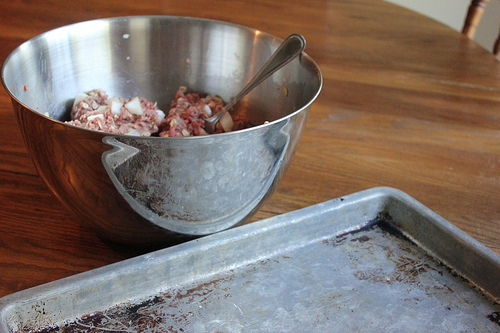 Quick tip – use a greased broiler pan (spray pan AND rack); all drippings run away from meat balls. TB ea worc. & yellow mustard. I used to really dislike shaping meatballs, but now I use a medium size cookie scoop. It really saves time. These can also be placed in the oven, frozen. I bake them at 350 for 1 hour or 1 hour and 15 minutes. They are delicious – this has been my go-to recipe many times over. Thanks so much for letting us know that! I’ve never tried baking them straight from the freezer! 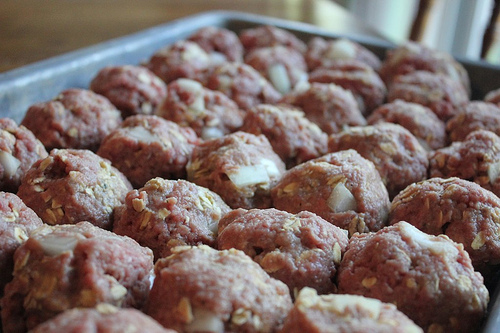 I just used up the last of my meatballs… time for another batch. I didn’t cook much more than bread today (I also was able to whip up a batch of coffee creamer, baking powder and chili powder to replenish my cabinet which I have had on my procrastination list a while). Yesterday I Made 3 lbs of mixed ground turkey and beef with lentils and beans and taco seasoning. This made 3 taco meat dinners and then I added a can of refried beans and tomatoes for a spin on your brown bag burritos. I was very happy with the results! Would you please share your recipe for coffee creamer? I would love to try that! Sure! I love coffee creamer… but have you read the ingredients that goes into coffee mate?! I was a bit shocked. I find that with this recipe I am able to have as much coffee as I want with no headache or stomach upset – who knew. I like to keep iced coffee in the fridge too. So when I make a batch of creamer, I make a pot of coffee too. I mix the pot and 1/2 the creamer in a pitcher for my ice coffee fix, and store the left over creamer for my hot coffee. The sweetened condensed milk isn;t always around and it makes the creamer super sweet. So this is what I have been doing instead. It is easier to control the sweetness and I just throw it all in the blender. DIY sweetened condensed milk- FYI I don’t add the butter. I do this, too with a sauce very similar to Crystal’s recipe. I also recently put pre-cooked meatballs in the crockpot with a jar of spaghetti sauce before leaving for church Sunday morning. When we got home, I just had to cook the noodles and fix a salad. I cook mine before freezing also. If I need meatballs in a hurry I defrost them a little in the microwave and then left them heat up the rest of the way in a pot of sauce. I have actually put the frozen raw meatballs with sauce in the crockpot on high 3-4 hours and they turned out great. I haven’t frozen them uncooked before, but I’m going to try that for my next batch of freezer meatballs. I’m sure it would prevent the batch from drying out. I think I’ll have to try this recipe. I think I’ll use my own barbecue sauce recipe, though, since it has much less sugar. I know my son will love these and I’ve never made meatballs for the freezer. I did make 2 batches (different recipes… one was yours Crystal) of protein bars today and 1 batch of clean eating cherry oat bran muffins for the freezer. Barbecued meatballs are great to take to church dinners, too. I have made them in the crockpot (brown them in the oven first) many times, and there are usually not any left over. i dont particularly like barbecue sauce but i have a meatloaf recipe that is very similar except it has a cup of tomato sauce instead of the chili powder & garlic powder. Would that work? could i still make the recipe like that? I’m dreaming of a meatball sub! Meatballs is also a South African favourite but takes a little time for a full time out of house working mom of 3 like me. This has inspired me to make it in advance and just pop it in the oven when we fall into our house one evening. One thing that I have also done in the past with much success, [also if you’re short on money for meat], is to ad some TINNED BROWN LENTILS. Works a charm!! Needless to say the past week I have just been getting adjusted to this new arrangement. I never thought of not cooking them and freezing them. Thanks again for doing this series. I’ll have to try this recipe, I usually cook mine before freezing as well. I liked mine cooked because then I just put them in a pot with homemade grape jelly and chili sauce. My kids always loved this easy recipe. 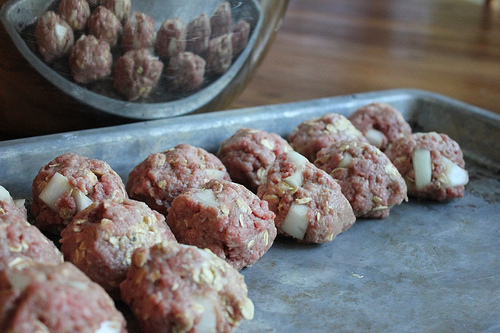 I used to make meatballs, cooked and frozen, for my teenage son to use in meatball subs. It was an easy way for him to make a good meal – just reheat the meatballs in the microwave, then assemble the sandwich with meatball, spaghetti or pizza sauce, and mozzarella cheese which he heated until hot. Do you have a freezer recipe for twice baked potatoes? I know I have seen one somewhere. Boy, that would make this a super easy meal if you had homemade rolls in the freezer ready to go, too. Yummy! I love oatmeal in my meatloaf/meatballs. My mom always used it in her meatloaf, and people who don’t like meatloaf liked her recipe. Now I don’t use her meatball recipe (almost exactly like this one), because I make meatballs Italian style to serve with pasta & sauce. I always freeze the Italian meatballs so that I can add them to my homemade sauce (which I also freeze), and the fat will have already cooked mostly out. (That way I don’t have a grease slick in my pot.) 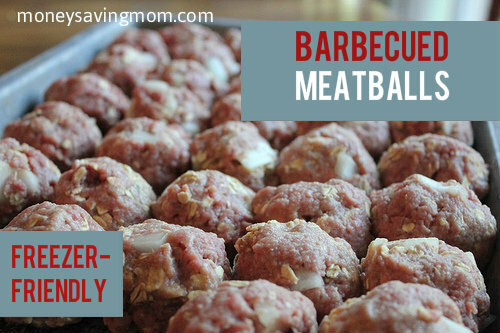 I love the idea of just throwing the meatballs in the crockpot with the bbq! These look great. I will add this to my plan. I am a little behind because of sickness. But I am still plugging away. I like the idea of adding lentils. 🙂 Now to decide if I will cook them before freezing. I’ve made these exact meatballs for years my family loves them .I’ve never frozen them so I’m looking forward to that . I don’t know if my original comment made it or if they are moderated but…I was adding my two cents by saying I bet you could also combine all the sauce ingredients & freeze. Then turn it into a slow cooker meal by starting in the morning on low for a bubbling hot meal later in the day! This has been our family’s favorite meatball recipe for many years! I usually bake them before freezing (without sauce) at 350 for about 30 minutes, then flash freeze them on wax paper lined cookie sheets. Once frozen, transfer them to freezer bags in meal-sized portions. That way they really just need to be heated once you are ready to use them. We love them with BBQ sauce but use them in any way that you would use meatballs. I prefer to bake my meatballs, flash freeze them and bag them up in freezer bags. That way I can pull out however many I need for a meal. We use them with spaghetti, in pasta hot dish, for meatball subs. It’s great to just pull out the amount you need and not have to worry about cooking them first. These meatballs sound great!! I’m a little behind and just finished a batch of Brown Bag Burritos. I decided to skimp on the ground beef and just add about a pound and then made up the bulk difference with an equal amount of mexican rice. They came out AWESOME!! I don’t have time to read all the posts so maybe someone has already asked this question. Couldn’t you cook the meatballs in the crock pot with the barbeque sauce and if so, how long? I wouldn’t recommend cooking them in the crockpot with the sauce because the grease will then get mixed into the sauce. However, if they were baked and drained, you could then stick in them crockpot with the sauce for a few hours to finish cooking with the sauce on. Do you eat these by themselves with just sides? Over rice? They sound super good! How many meatballs would you say this makes? And about an egg substitute, could you use flaxseed? I know you can substitute an egg for flaxseed mixed in water, just curious if if would work on this recipe! Thanks! I look forward to trying these. These were delicious!!! My husband devoured them and my picky 4 year old ate them too. Thanks for the recipe! These were great! Thanks. Made enough for dinner tonight and enough for 2 freezer meals. I only had 2 lbs ground beef so used one lb ground pork too and got compliments from my husband.